The first thing you need to know is that I find Arjun Kapoor adorable in just about anything. And I’m one of those people who enjoyed Tevar. Still love Superman! I had big hopes for Ki & Ka. We haven’t seen Arjun in a film for over a year. But Ki & Ka, while it had some enjoyable moments, was a disappointment. 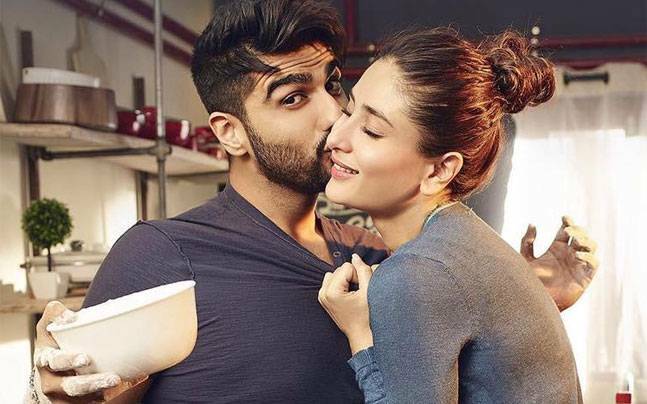 I liked the chemistry between Arjun and Kareena, and am glad she broke her “no kissing” pledge. I feel like this is a film that had an interesting concept, but the script still needed work. And maybe a woman’s perspective on the script. Kareena is Kia, a very ambitious marketing executive. She meets Arjun’s Kabir on a plane when he is sobbing over his late mother’s birthday. They go out for a drink after the flight and he stuns her during a date by telling her he wants to be a housewife just like his mother. His father is a very wealthy builder, and Kabir has been a “topper” in an MBA program, but has no interest in the rat race. He proposes they marry after a very brief courtship. He’ll create the home she’s never had (her single mother sent her to boarding schools), and she can pursue her career with no barriers. Arjun’s character is just too perfect. There was really no comedy of him dealing with learning to manage the house. He’s a master chef. He redecorates (with model trains!!). He manages Kia’s mothers sugar levels by cooking healthy food. Kia gets home late, and rather than complain, he just massages her feet and covers her with a blanket. The conflicts are pretty predictable in their marriage, and are resolved very quickly. Maybe it’s the Indian cinema thing about having a hero be perfect with no flaws. While advantageous in a crime fighting supercop, in a domestic drama it’s not quite as interesting. This movie is not helped by the fact that I’ve just seen Kapoor and Sons twice. Now THAT is a domestic family drama where everyone is complex and has flaws. The couple also don’t have children by the end of the movie. That’s the kind of thing that could have provided comedy by upsetting his perfect routine. There is a pregnancy scare, and you can see Kareena added layers to her reaction that were probably not in the original script. Kudos to her for trying to add depth. But once the scare is over, the issue is never dealt with again. Yet another missed opportunity. So many directions this plot could have taken, that were just left hanging. Balki, the writer/director is evidently known for these high concept films, but not great follow through. Having more subplots and side characters would have helped this film, too. That said, Kareena and Arjun give it their all, and I did like their chemistry. It was a pleasant timepass, but not the deep social commentary it was preaching to us about. The cameo by Amitabh and Jay Bachchan, though, was a delight! I do enjoy this song! But the rest of the soundtrack was just okay. Kathy Gibson of AccessBollywood.net and I saw the film at the same showing. She really hated it. Margaret of DontCallItBollywood.com goes in depth into the missed opportunities in the film. And gives a full summary here comparing it to a sitcom! Thanks for the link, Mel! “He manages Kia’s mothers sugar levels by cooking healthy food.” Okay, this cracked me up because his very first solution to managing her sugar levels — before he starts making tasty salads — is to replace Mom’s morning coffee…with juice! I need to start a Letterboxd list of Bollywood movies with dubious or incorrect medical advice and add this to it. Anand, I really liked your post! It was super interesting! Since I am not a Hindi speaker, I didn’t get the subtlety of the language that you talked about. I know that ki is feminine and ka masculine, but that’s about it. Priya, yes he is! I hope he gets some better films coming up.